In a survey of 202 respondents, primarily composing of B2B and hybrid B2B companies, Influtive and Konye Marketing discovered that customer marketing has become an integral marketing strategy and that it is on the rise. Businesses are no longer solely focused on bringing new customers – they are trying to retain existing consumers of their business. Their research report “The State of Customer Marketing 2017” states that 93% of these organizations expect that their customer marketing efforts will take on greater importance, and 62% will increase their staff or budgets in the area for 2017. With only 61% of them satisfied with the results of their current customer marketing efforts, there is a great chance of growth in the customer marketing arena. Here are 8 customer marketing trends that are likely to transpire in 2017, and in the coming years. Forget the sleazy salesperson stereotype. Today’s most successful salespeople act as thought leaders and industry experts, connecting prospects with content. They challenge buyers to be on the cutting-edge of their industries. But unfortunately, many people still harbor a negative perception of sales reps. So what’s a salesperson to do? Load up on content. This infographic explains how content helps sales teams build relationships that lead to revenue. 1) 27% of total U.S. internet time is spent on social networking sites. (Source: Experian) Tweet this stat! 2) 15% of total U.S. mobile internet time is spent on social networking sites. (Source: Experian) Tweet this stat! 3) Social media produces almost double the marketing leads of trade shows, telemarketing, direct mail, or PPC. (Source: HubSpot) Tweet this stat! 4) Social media lead conversion rates are 13% higher than the average lead conversion rate. (Source: HubSpot) Tweet this stat! 5) 21% of marketers say that social media has become more important to their company over the past six months. (Source: HubSpot) Tweet this stat! 6) 74% of all marketers say Facebook is important to their lead generation strategies. (Source: HubSpot) Tweet this stat! 7) Companies that generate more than 1,000 Facebook Likes also receive nearly 1,400 website visits a day. (Source: HubSpot) Tweet this stat! 8) 52% of all marketers have found a customer via Facebook in 2013. (Source: HubSpot) Tweet this stat! 9) On Facebook, brand posts get half of their reach within 30 minutes of being posted. (Source: Socialbakers) Tweet this stat! 10) 85% of fans of brands on Facebook recommend brands to others, compared to 60% of average users. (Source: Syncapse) Tweet this stat! 11) 43% of all marketers have found a customer via LinkedIn in 2013. (Source: HubSpot) Tweet this stat! 12) 36% of all marketers have found a customer via Twitter in 2013. (Source: HubSpot) Tweet this stat! 13) 59% of Twitter users have visited B2B tech brand sites, compared to 40% for the average internet population. (Source: Compete and Twitter) Tweet this stat! 14) 25% of consumers who complain about products on Facebook or Twitter expect a response within 1 hour. (Source: American Express) Tweet this stat! 15) Women are more likely than men to regularly check out a brand’s social page (48% vs. 43%). (Source: Ipsos) Tweet this stat! 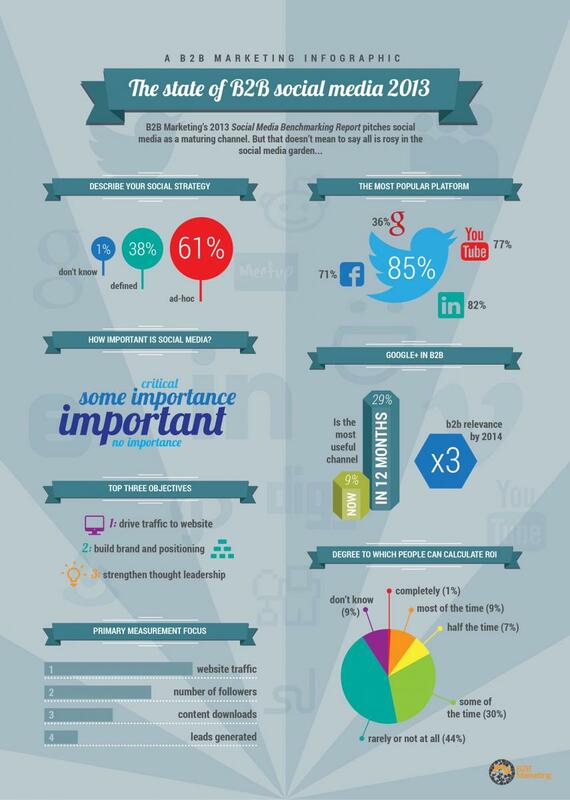 16) 23% of marketers are investing in blogging and social media this year, a 9% increase from 2012. (Source: HubSpot) Tweet this stat! 17) Approximately 46% of online users count on social media when making a purchase decision. (Source: Nielsen) Tweet this stat! Advertising for innovative products and services are everywhere, but it’s rare to find any that will actually help you out in that very moment. 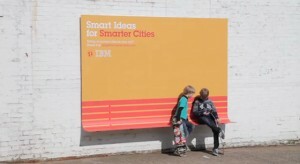 IBM does just that with its new outdoor advertising campaign from Ogilvy & Mather France, Adweek reports. A simple curve in three different outdoor ads help them turn into structures that are actually useful to passersby: benches, shelters, and a smooth runway along a stairwell for bikes or luggage. The simple bit of innovation showcases the way IBM approaches the world while also hoping to inspire others to share their ideas on making cities more efficient and effective for its residents. 67% more leads per month for companies with an active blog. IBM reported a 400% increase in sales tied to social selling. 90% of B2B companies reported using Facebook. 53% of B2B companies reported using Twitter. 47% of B2B companies reported using LinkedIn. 33% of B2B companies reported using a blog.